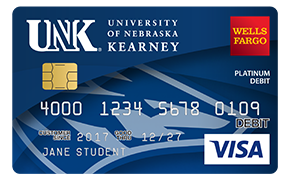 The University of Nebraska at Kearney and Wells Fargo have teamed up to offer you the optional UNK Loper Life Debit Card. When it is linked to a Wells Fargo Everyday Checking account, it allows you to make everyday purchases and pay bills worldwide at participating retailers and service providers, as well as to give you free access to cash at Wells Fargo ATMs nationwide. University of Nebraska at Kearney receives financial support from Wells Fargo for services associated with the Loper Life Debit Card to help offset costs. A separate Loper Life Debit Card linked to a Wells Fargo account is not required for students, faculty and staff to access other campus services; a standard campus ID card may be utilized. Visit one of the two nearby Wells Fargo banking locations in Kearney.